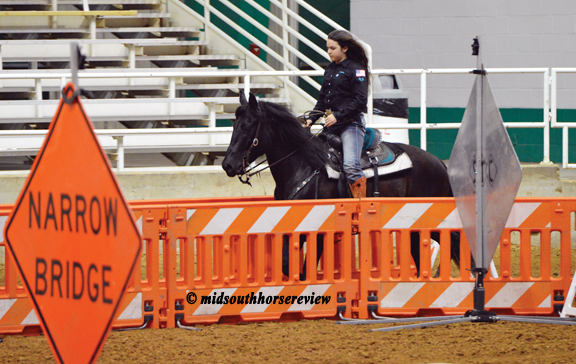 Folks knew there was construction going on at the Show Place Arena in Memphis, Tennessee, but over the weekend of May 5-6, 2018, the indoor arena looked like TDOT had converted the indoor arena to a construction zone. No, there wasn’t road construction inside the arena. 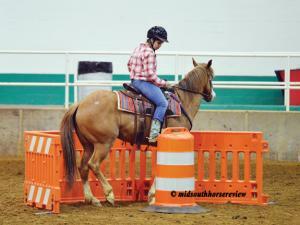 It was obstacle course set up by The Dixie Outlaws, a new EXCA club in the midsouth area. EXCA, the Extreme Cowboy Association, and with it the Extreme Cowboy Race,™ was originated by Craig Cameron to challenge horses and riders to negotiate their way through a wide variety of obstacles. The majority of obstacles that riders encounter at a sanctioned EXCA event are things that one would routinely encounter on a trail ride or daily work on a ranch. However – there are exceptions for creativity! 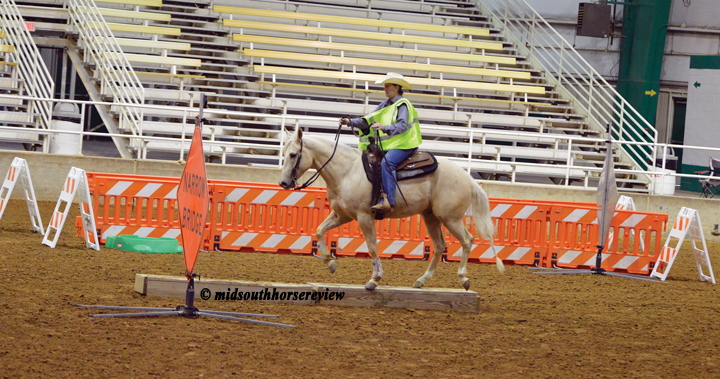 Sherry Garman, member of the Dixie Outlaws Advisory Board, explained that the obstacle courses usually have “themes.” For example, this weekend’s indoor arena was set up with a “Construction Zone” theme. 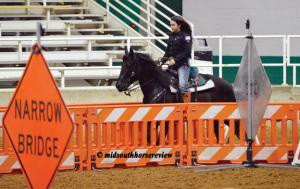 Another course was the “Outlaw Arena,” set up like an old west town. Another was the “Dixie Playland,” with kiddie pools, swim noodles, inflatables, and hanging noodles to walk through. “The courses are always different. 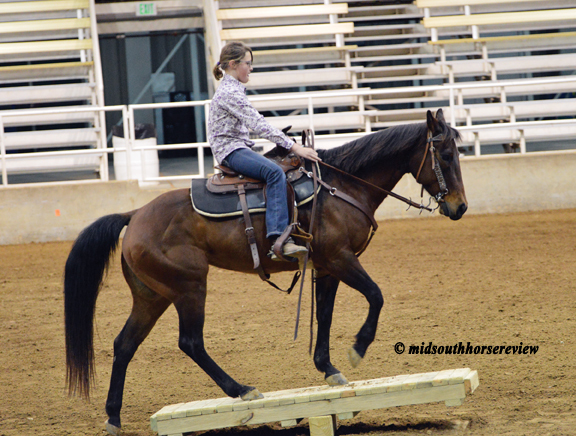 It’s the confidence and trust between horse and rider that allows the team to successfully negotiate the obstacles,” Sherry explained. 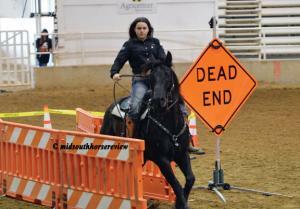 All breeds of horses and riders of all levels are invited to participate. Horsemanship and equine partnership are judged as the horse and rider team negotiate their way through obstacle courses in a timed event. This is the first event for the new club and their first time in Memphis for this event. The members were pleased with the event and the turnout. They like the central location of Memphis and all the amenities that are available within a short distance of the venue. The show attracted around 95 entries from “all over,” Sherry said. Riders came from Kansas, South Caroline, Indiana, Ohio, and of course Tennessee. The Dixie Outlaws were the first group to use the newly completed Warm Up Arena with its covered front porch, party rooms, and office space. On Friday night, the “party room” was put to good use for the Welcome Party, with special guests: Nashville singers/songwriters Joe Hash and Scott Southworth. Earlier in the day, the group offered two sessions of a Lee Hart Horsemanship Clinic. Plus, there were plenty of raffle items donated from their sponsors on which riders could bid. Then on Saturday, the races began, with nine divisions competing: Green Horn, Young Guns, Youth 12-17; Novice 18 & older; Green Horse; Intermediate; Non-Pro; Ride Smart; and Pro. On Sunday, the top ten from Saturday’s races came back for the Showdown Championship. 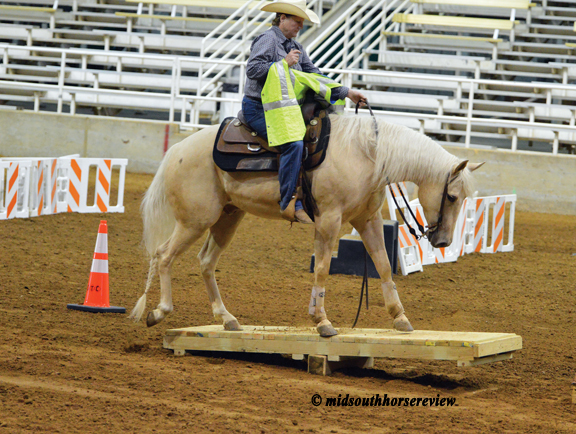 Judges for the event were: Lee Hart, head judge (Level 4) and course designer from Topeka, Kansas; Johnie Clem, Level 3 judge from Turners, Missouri; Jim Ochs, Level 1 judge from Gridley, Kansas; Julie Murphy, Level 1 judge from Mooreville, Mississippi; Bret Lambdin, Level 1 judge from Mount Dora, Florida; and Rick Peniston, Level 1 judge from Mint Hill, North Carolina, with Joel Mobley as the Showdown announcer. If you missed this one, there are more EXCA events coming up. The Extreme Cowboy Race National Championships will be June 2-3, 2018 at the Morgan County Celebration Arena in Decatur, Alabama. The Dixie Outlaws will have their Tennessee State Championship in Lynnville, Tennessee at the Circle G Ranch on July 21-22, 2018.